Gillingham have signed Bristol City defender Adam El-Abd on loan until the end of the campaign. 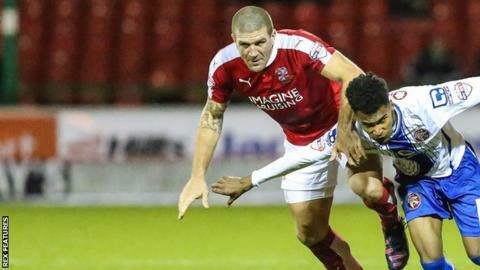 The 31-year-old played 14 times during a three-month spell with fellow League One side Swindon earlier this season. The former Brighton & Hove Albion centre-half has made just 20 appearances for Bristol City since joining them in January 2014. "It will be good for Adam to go out on loan and get regular football under his belt," said Robins boss Lee Johnson. BBC Radio Kent reports the arrival of the Egypt international at Priestfield Stadium means Gills boss Justin Edinburgh is now unlikely to re-sign Cardiff defender Deji Oshilaja on loan. Earlier this week Brighton defender Adam Chicksen extended his loan spell with the Gills for a further month.